When you are striving to boost your T levels, it is important that you don’t just focus on your training, but on your diet too. This means taking account of all foods that you eat, including snacks and sweet treats. 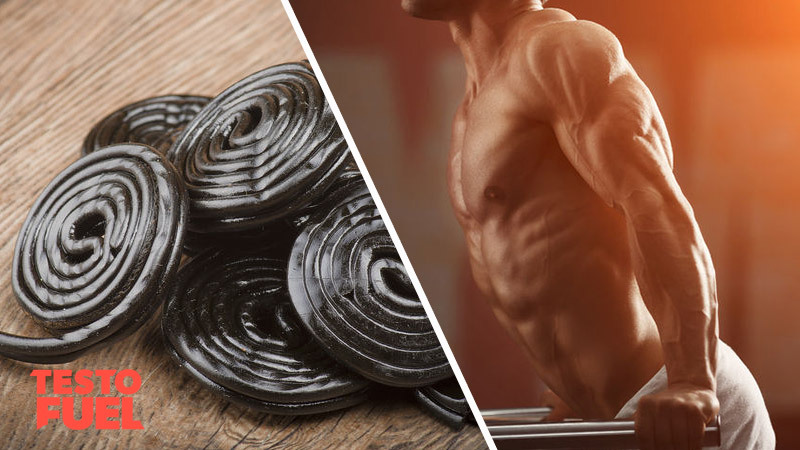 Licorice is a well known and well loved candy and is often touted as a health food – it derives from a natural plant and has been used for respiratory and digestive illnesses for centuries. On the face of things it seems like a harmless occasional cheat food. Does it affect testosterone and cortisol? 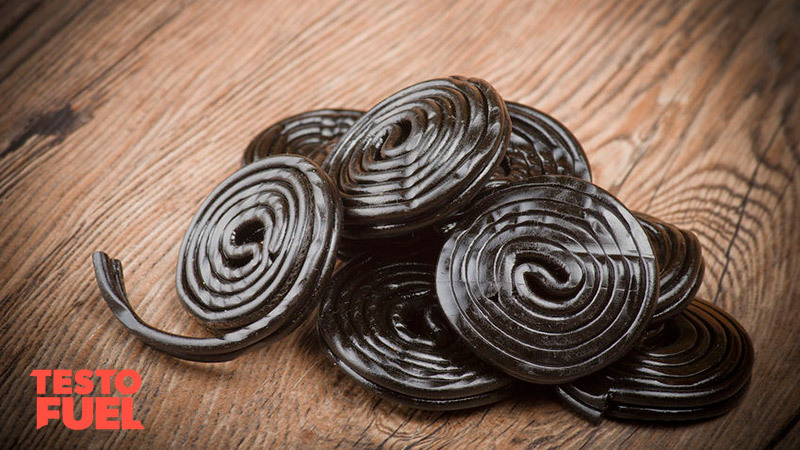 Licorice comes from the root of the wild glycyrrhiza glabra plant and is native to Asia and southern Europe. It has been used for its supposed medicinal qualities in ancient China, and has been part of herbal medicine since the former Han era – 2nd – 3rd century B.C. . The main bioactive compound of the root is glycyrrhizin, a compound that is extremely sweet. The name has the literal meaning ‘sweet root’ and as such is used to sweeten and flavor products such as candy and breath fresheners, herbal teas, cough mixtures and soft drinks. It is 50 times sweeter than sucrose – cane sugar . Glycyrrhizin is a saponin – a type of steroidal compound found in plants. It accounts for between 2 and 25% of the total root depending on the species. The plant contains many other metabolites such as glycyrrhetinic and glycyrrhizic acid as well. Key Point: Licorice contains a sweet tasting bioactive compound called glycyrrhizin. It is used to flavor candy, soft drinks and herbal teas, as well as some medicinal products. As a regularly researched plant, there are quite a few studies that have analyzed its effects on testosterone. Here is a breakdown of the most relevant ones. This was the first study linking the effects of the sweet root with the male hormone testosterone. It was an in-vitro study meaning that it was done using a test tube under lab conditions. The results found that by eating the sweet root plant, T levels decreased by ~40%, meaning that it had a strong inhibitory effect. Interestingly, the inhibitory effect depended on the concentration of glycyrrhetinic acid – the more there was, the lower T levels became. The authors of the study concluded that glycyrrhetinic acid interfered with 17β-hydroxysteroid dehydrogenase – an enzyme that is involved in synthesis of steroid hormones such as testosterone. In this study, published in the New England Journal of Medicine, human studies were conducted on 7 young men. They were each given 7g daily of a commercial preparation sweet root in the form of tablets. Each tablet contained a relatively small amount of glycyrrhizic acid – 0.5g. The results found that by day 4 of the study, T levels fell dramatically, from 740ng/dL to 414ng/dL. If you consider that anything under 300ng/dL is considered clinically ‘hypgonodal’ or ‘low T’ then this is quite a significant drop. Again the results suggested that the steroid hormone stimulating 17β-hydroxysteroid dehydrogenase was inhibited. In this study, again by Armanini and colleagues, a group of 25 male volunteers were given 7g of sweet root containing 500mg glycyrrhetic acid. Even after a week, testosterone levels had plummeted by 26%. The effects were short-lived however, with T levels returning to normal after a weeks recovery. It’s not just men either that will suffer the T felling effects of the sweet root. A study in the journal Steroids  found that when healthy women are given 3.5g of commercial sweet root daily (7.6% glycyrrhetic acid), T levels fell by 31% after one menstrual cycle, and a further 63% in the second cycle. Key Point: Licorice significantly decreases testosterone in both men and women. Does sweet root effect cortisol levels? Cortisol is the body’s stress hormone – it increases in times of physical or emotion stress and has a negative impact on testosterone. Studies have shown that not only does the sweet root plant extract decease T levels, but can increase levels of stress hormone too – a syndrome known as ‘mineralocorticoid excess’. The Journal of Human Hypertension  investigated the use of 100g of the product daily over a 4-week period (150mg glycyrrhetinic acid) on health status, and found that total and free cortisol increased significantly over the course of the study. Not only that but blood pressure increased at the same rate. Likewise, similar results were found in a group of 22 men and women given glycyrrhetinic acid in a sweet root candy. Results reported that cortisol levels increased, as did DHEA – a precursor hormone to testosterone. The increase in cortisol can have dramatic effect on testosterone levels, particularly when ingested over a long period of time. This suggests that the sweet root plant is one to be avoided if increasing T levels is what you are after. Glycyrrhizin – are there any side effects? Additionally, sweet root has been found to decrease libido in men and can even cause erectile dysfunction. As these actions are controlled by testosterone it makes sense that they would reduce if your main male hormone decreases too. Summary – does licorice decrease testosterone? Licorice is from the root of the wild glycyrrhiza glabra plant. Its main bioactive metabolite is glycyrrhizin, a compound that is extremely sweet. The name has the literal meaning ‘sweet root’ and as such is used to sweeten products including candy and breath fresheners, as well as herbal teas, cough mixtures and soft drinks. It is 50 times sweeter than sucrose – cane sugar. Research has shown that this plant can significantly reduce testosterone levels in both men and women when taken for prolonged periods or in large doses, by inhibiting the enzymes needed to stimulate steroid hormone production. In men, it may also reduce libido and sexual function too. There are a number of other side effects associated with the active compound glycyrrhizin. These include high blood pressure, headaches, fatigue and muscle pain. Omar, HR et al. Licorice abuse: time to send a warning message. Ther Adv Endocrinol Metab. 2012; 3(4): 125–138. What Does Licorice Root Do?